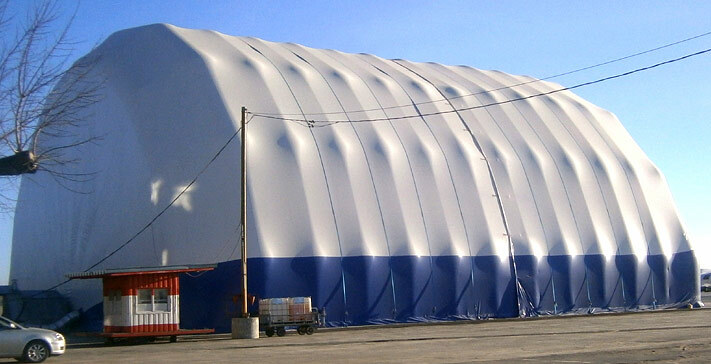 Inflatable building (IB) is an inflatable structure. The primary bearing elements are comprised of semi rigid arching tubes filled with compressed air. 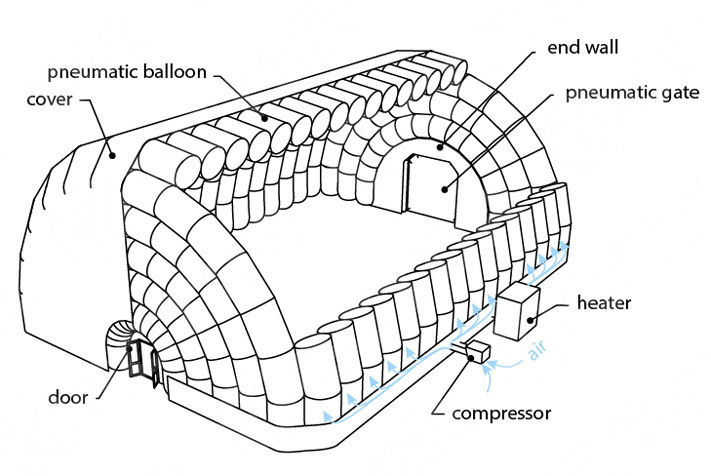 Inflated arches filled with pressurised air are linked to each other as a unified structure thus comprising a building framework covered by membrane. The frame sub elements and membrane are manufactured of PVC coated elastomeric fabric and joined together by means of high frequency welding. All welded seams are air and water proof and have high tensile strength. All air filled tubes do not need ongoing pressurising. An air blower [compressor] with automatic switch maintains preset air pressure. Depending on the type of framework there are two types of inflatable buildings: modular and one piece inflatable. The building of this type consists of separate arch shaped modules filled with compressed air. Each airproof arch segment is linked to the adjacent one with the help of specially designed carabines and has a dedicated compressed air supply line. In a case of damage to the each individual segment the structural integrity of the whole frame does not suffer and it can be easily swapped or repaied. Modular IB air-supported shelters are light weight, low cube, and are rapidly erected thanks to each module minimal weight. These building are highly adaptable to clients needs: they are easily repositioned and joined in many ways, extra modules may be added as needed. 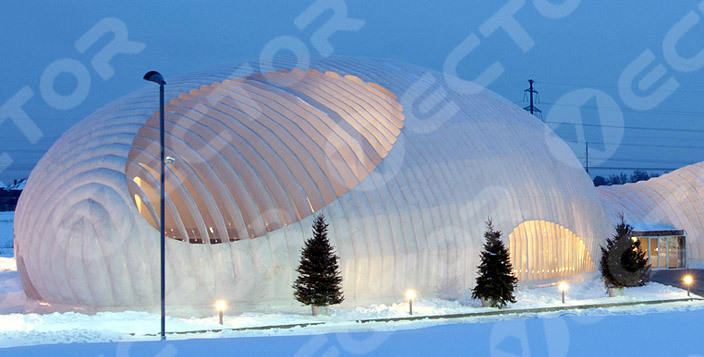 One piece inflatable building is a single air and waterproof structure. This type of structure does not require a fabric membrane. It presents a wide range of design options. However, the use of this technology is limited to the building whose width does not exceed 20 meters. All our fabric memraines are made of technical fabrics coated with polyvinyl chloride (PVC) manufactured by Mehler Technologies of Germany, which is one of the world’s biggest fabric manufacturer Valmex and Polymar fabrics are durable and well proved under most adverse climatic conditions. The main performance features of fabric membranes made by Mehler are as following: high tensile strength, excellent resistance to chemical spills and mechanical impact, wide range of operating temperatures. electrical insulation, fire retardation, UV radiation and weather elements resistance, environmental safety. Inflatable construction technologies enable to use a wide range of equipment and structures. You can use industrial automatic gates, metal-reinforced plastic doors and even stained glass compositions. We can also manufacture pneumatic doors and gates at the request of the customer. We can also use the simplest and most cost-effective input/output system of self- opening curtains of PVC fabric. Windows are made of transparent material. The air supply system is installed in the outer noise-dampening box and consists of a main and spare hot air blower, an automatic pressure control device and a diesel generator. The main hot air blower switches on periodically when pressure drops in the structure and switches off when it reaches the upper limit. The spare hot air blower switches on in case of the main does not provide enough pressure for some reason. In case of electrical power cutoff diesel generator switches on. The air supply system is operated by an automatic pressure control device. When installing the inflatable building on a concrete foundation anchor fastening method is used, when installing on the ground foundation - screw piles are used. We can also use ballast during installation in the form of water-filled cylinders or sandbags. PVC fabrics are light transmitting. On daylight hours outdoor lighting is used. It is possible to manufacture the windows of transparent material. You can use artificial lighting by means of lamps fastening system using if necessary. Heat generators, forced air heaters and air-conditioning systems of well-known manufacturers are used as equipment for microclimate creating.